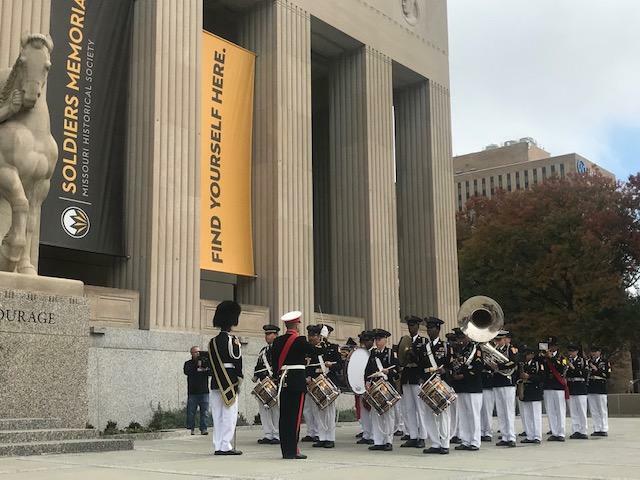 Performing with pride to help honor those who made ultimate sacrifices in service to our country, Missouri Military Academy Band supported the re-opening of the Soldiers Memorial Military Museum on Saturday, Nov. 4, 2018. MMA was honored to receive an invitation to support the re-opening ceremony of the Soldiers Memorial Military Museum, a state-of-the-art facility that honors military service members, veterans, and their families from St. Louis. Celebrating the $30 million Missouri Historical Society revitalization project, the re-opening ceremony was held on Saturday, Nov. 4, 2018. The Soldiers Memorial is located downtown at 1315 Chestnut Street, St. Louis, MO, 63103. For more information, visit mohistory.org/memorial. View photos of the event from the St. Louis Post-Dispatch.